For particular advanced therapy medicinal products (ATMPs) in the European Union (EU) which involve genetic modification (in vivo or ex vivo) consideration must be given to legislation for Genetically Modified Organisms (GMOs) in addition to Clinical Trial Authorisation (CTA). Unlike the relatively harmonsied CTA approval producedure across the EU, GMO notification has until recently been a relatively infrequent consideration for developers of medicinal products. This has led varied interepretation and implementation of the law in each member state affecting how, what, when and to whom to submit as well as the scope of an approval in relation to a clinical trial. Addressing this European hurdle has been on the EC’s agenda for some time. To help developers, the EC has initially published a new repository with an overview of the key national requirements within Europe. Importantly, the EC has highlighted that these new documents are for information; the legal responsibility for oversight and approval remains with the relevant competent authoritiy. Click here to access to the repository. The Conditional Marketing Authorisation (CMA) was introduced to support early access to medicines that address unmet medical needs of patients in the European Union (EU). It allows for the initial authorisation of medicines if the public health benefit of their immediate availability to patients outweighs the risk (i.e. in seriously debilitiating/life-threatening diseases, medicinal products for use in emergency situations and orphan medicines). The holder is required to complete specific obligations e.g. new studies to obtain complete data to confirm that the benefit-risk balance is positive. The EMA Committee for Medicinal Products for Human Use (CHMP) review the data collected annually and decide about a further renewal of the CMA or its conversion into a standard marketing authorisation. The report analyses a total of 30 medicines authorised under CMA over 10 years between 2006 and June 2016. The majority (24/30) were for seriously debilitating or life-threatening conditions and 14/30 medicines were orphan indications (14/30). Only 3 products were classified under emergency situations; all for influenza pandemic vaccines. CMAs have been granted for the following therapeutic areas: oncology (17/30), infectious diseases (9/30), neurology (3/30) and ophthalmology (1/30). The report recognises the success of this regulatory tool. 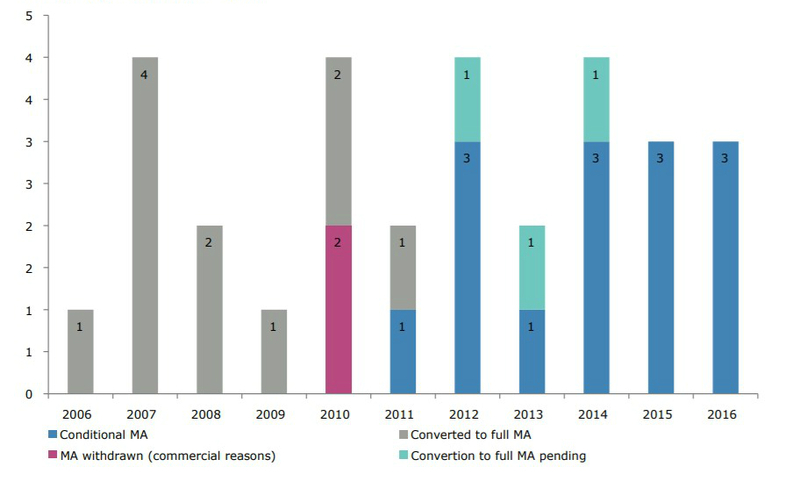 On average, a CMA is converted into a standard marketing authorisation within 4 years. EMA recommends an early dialogue with agency and prospective planning of CMAs to prompt assessment, completion of additional studies and availability of comprehensive data. Click here to access to the EMA report in full. In October 2017, EMA and EC published a joint action plan to improve the regulatory framework for advanced therapy medicinal products (ATMPs). The objectives are to increase the opportunity for EU patients to be treated with novel innovative therapies and to address the specific bottlenecks for ATMP development. a draft revised guideline on safety and efficacy follow up and risk management of ATMPs. The document describes the evaluation process and review timetable for ATMPs, as well as the roles and responsibilities of the various rapporteurs and committees involved in the assessments. A representant of each committee during discussion will ensure a consistent flow of information and facilitate discussions between committees. Describes the role of the Committee for Pharmacovigilance and Risk Management (PRAC) in the assessment of the ATMPs. A PRAC rapporteur is also appointed from amongst the members and alternates of the PRAC. Due to the novelty, complexity and technical specificity of ATMPs, these products need to be managed through the risk management plan. This revised draft guideline is currently in public consultation until 30 April 2018. The document reflects EMA’s experience gained with the authorisation of these medicines, as well as the experience with scientific advice and protocol assistance. The rules described in this guideline are developed to facilitate risk detection of particular ATMP risks and provide a framework for effective mitigation of their impact to patients (e.g. educational programme). The guideline also provides methodological advice on design of appropriate post-authorisation studies to follow up on the safety and efficacy of these medicines. Click here to access to the guideline in full. As part of a medicine’s European Public Assessment Report (EPAR), an orphan maintenance assessment report will now be published for every orphan-designated medicine which has been recommended for marketing authorisation. This new report addresses stakeholder requests for increased transparency with regards to decision-making for orphan medicines market exclusivity. The new report will summarise the decision making process by the EMA Committee for Orphan Medicinal Products (COMP) on whether a medicine designated as an orphan medicine during its development still fulfils the designation criteria at the time of its authorisation. This confirmation will allow the license holder to benefit from ten-year market exclusivity, considered to be the biggest incentive of the European Union (EU) orphan programme. In a statement, Bruno Sepodes, the Chair of COMP also highlighted that “health technology assessment bodies (HTAs) might use this additional information when establishing the cost effectiveness of the medicine”. The EMA is launching a survey for Marketing Authorisation (MA) holders of centrally authorised medicines regarding their plans to prepare for Brexit. On its Brexit Q&A published in November 2017, EMA highlighted a future requirement that holders of centrally authorized medicines located in the EU will need to transferthis license to a legal entity in the EEA, ensure a Qualified Person for PharmacoVigilance (QPPV) is located in the EEA as well as ensure any SME is registered in the EEA (directly or indirectly) to continue benefiting from SME incentives. plan resources in the areas where these submissions will be processed. In the figure below, EMA captured the porportion of UK-based activities that will require action. The survey must be completed by 9 February 2018. Once complete, the EMA will publish a high-level summary of the overall results. to have a technical documentation in place. MHRA launched an extensive consultation (until 31st March 2019) on the draft guidance on health institution exemptions under IVDR/MDR. The draft includes sections on the transfer of devices, quality management systems, manufacturing, surveillance, governance, distance sales and control of subcontractor. The MHRA would appreciate help from a broad range of stakeholders in developing guidance and feedback on whether MHRA is taking the right approach to the regulation of devices. Click here to view the CBER guidances. As part of FDA efforts to enhance transparency, a new (voluntary) pilot program has been launched to evaluate whether disclosing certain information included within Clinical Study Report (CSRs) following approval could improves public access to drug approval information. The EMA began taking similar steps in 2016. Specifically, it will include the study report body, the protocol and amendments, and the statistical analysis plan for each pivotal study included. The pilot will select up to nine recently-approved new drug applications (NDAs) whose sponsors volunteer to participate.